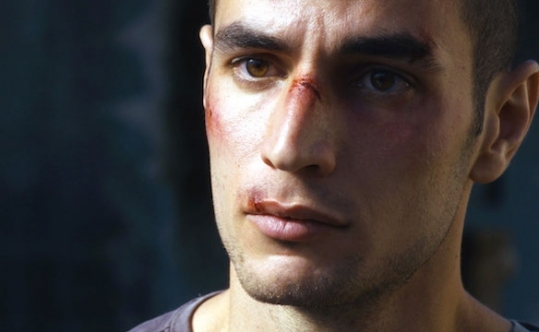 OMAR makes for not just a strong viewing experience but an instructive reading one. On the listing of the film over at Internet Movie Data Base, there is a heading titled ‘Message Boards’, where ‘ordinary people’ write in with their applause, questions or objections to the film. Reading through some of these reveals not just that a number of people were struck enough by the story to write about it with some vigor, but it also sadly shows, in a minority of the comments, the strain of mouth-breathing hatred you can readily tap on one side or the other of the Arab-Israeli drama. Some of the venom directed at “they” (conveniently swooping in a billion people) is positively Hitlerian in its certainty. I’ll leave my opinions on the right-wrong of the whole sickening, never-ending debacle to private dialogues with friends so as to not incite nor invite either bricks or spittle(brickspittle?) I’ll simply suggest (1)consider your news sources (2) dig a bit on your own (3) compare casualty figures. Jets vs. Sharks? How about jet-airplanes vs. rocks? How’s the movie? Very good, enough to be nominated for Best Foreign Film of 2013 at the Oscars, to capture glowing reviews, and to fully engage you for 96 minutes in its tense, spiraling, hopeless cry of outrage at how lives and loves are twisted and shattered by religious and political intolerance. 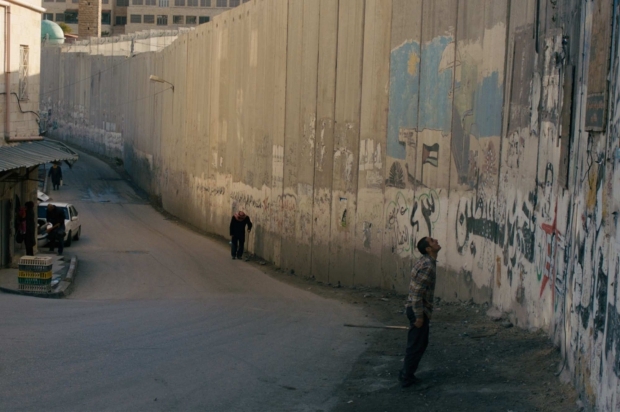 Written & directed by Hany Abu-Assad, it follows Omar (superbly etched by Adam Bakri), a Palestinian baker who risks death climbing the West Bank barrier wall to see his lover (Leem Lubani, doe-eyed and intense). 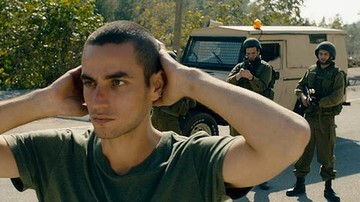 Violent encounters with Israeli soldiers lead to Omar’s imprisonment, where he is coerced by a security officer into working as an Israeli double-agent, infiltrating Palestinian resistance, which include his friends. Impossible choices arise out of an insane situation. Handsome twenty-five year old Bakri scored the lead right out of graduation from Lee Strasberg, while Ms. Lubani had no previous acting experience. If their riveting work here is an indication, we’ll see them both a lot in the future. There are some logic holes in the plot, but they’re negligible next to the overall impact delivered. With Eyad Hourani, Samer Bisherat and Waleed Zuaiter. When everything has been taken from you, and all you have left is pain, would you share it, and how?